One Cartridge. 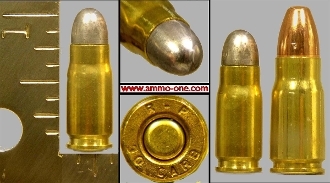 7mm Nambu Military Pistol cartridge, " New, Live, Custom Manufactured" with 60 grain Lead projectile. Made from new 30 Carbine Brass, a very labor intensive job. Head Stamps may vary. Also 8mm Nambu alvailable, please see below in related items. History of 7mm Nambu Military Cartridge: The 7mm Japanese Nambu was the introduced in 1920 for the "Baby" Nambu semi-auto pistol, and was only available to high rank Japanese officers. Today the 7mm Nambu pistol and older cartridges are a very scare item. Some older 7mm Nambu cartridges will sell for over $75.00.